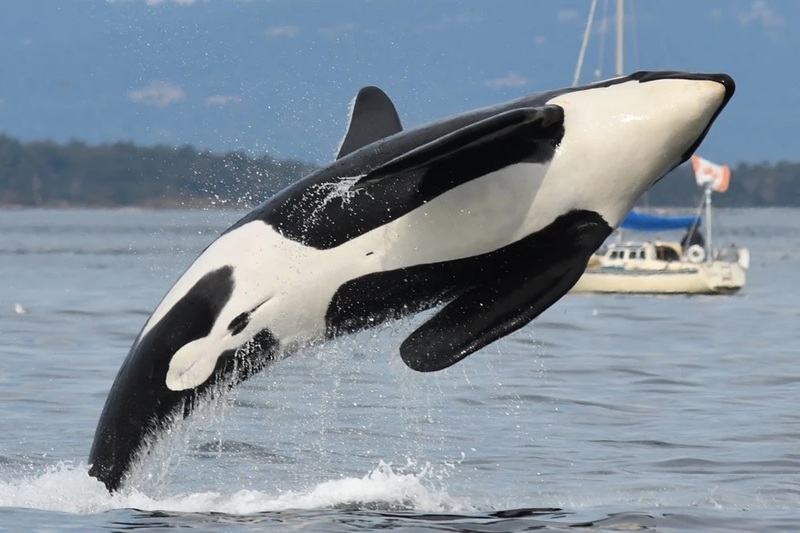 Killer whale observers were gleefully surprised this week when all three pods of Southern Resident orcas came into the Salish Sea — and all were in reasonably good shape. K-25, a 26-year-old male orca named Scoter, is seen breaching Monday when a large group of Southern Residents arrived in the Salish Sea. Remember, these same whales have been missing from Puget Sound for practically the entire summer — a period when they traditionally remain in and around the San Juan Islands while feasting on salmon. This summer has generated concern among those who understand the ways of whales. Some observers have feared that the orcas, wherever they were, might not be getting enough to eat (Water Ways, Aug. 18). That fear has largely disappeared, said Ken Balcomb, director of the Center for Whale Research who has been studying these animals for more than 40 years. Ken’s only concern was with a couple of young calves, 2 and 3 years old. They remain small for their age. (Ken calls them “runts.”) They probably have not received complete nutrition, given that the whales don’t seem to be finding chinook salmon in their regular feeding grounds. “We know that there is a problem with juvenile and infant survival,” Ken said, but there is hope that these calves will make it. Before they entered the Salish Sea this week, the three pods must have met up in the Strait of Juan de Fuca if not the Pacific Ocean, as all were together when they were spotted Monday morning near the south end of Vancouver Island by whale observer Mark Malleson. The Center for Whale Research sent out two boats. Ken and Gail Richard boarded the Shachi and met up with the leading group of orcas just east of Secretary Island. Ahead of the pack was J-19, a female orca named Shachi, who appears to have taken over the leadership role from Granny, or J-2, the elder matriarch that led J pod for decades before her death. On Monday, J-pod whales were clustered in their family groups along the Vancouver Island shoreline, while those in K pod were farther offshore and trailing J pod, according to Ken’s report. Not all of L pod was there, but those in the area were spending time in their family groups, or matrilines, even farther behind and farther offshore. Some of the whales were sprinting into tidal waters to catch salmon close to shore on the incoming tide of Monday afternoon, Ken said. As the whales captured fish, their social interactions with each other increased, at least among the family groups, Ken told me. Meanwhile, the second boat from the Center for Whale Research, Orcinus with Dave Ellifrit and Melisa Pinnow aboard, met up with the whales just west of Discovery Island east of Victoria. After a breakaway by the Shachi crew to transfer photos from Mark Mallinson, both boats continued to follow the whales until sunset. At dusk, the entourage ended up right in front of the center’s shoreline base on San Juan Island. Spurred on by this rare (for this year) sighting of all three pods, the five photographers in the three boats shot more than 3,500 photos in one day, Ken reported. Some of the best portraits and ID photos are shown with notes of the encounter. Other photos and expressions of excitement can be seen on Orca Network’s Whale Sighting Report. The researchers reported that all the whales in J and K pods were present — except for K-13, who had been reported missing (Water Ways, Aug. 18). Of the 35 orcas in L pod, 22 were seen on Monday. The missing whales are not a concern, Ken said, because the 13 not spotted were all members of matrilines that apparently were somewhere else. The next day, Tuesday, the whales were spread out in small groups in Georgia Strait on the Canadian side of the border. Yesterday, they traveled back through Haro Strait in the San Juan Islands, then headed on west toward the Pacific Ocean. It will be interesting to see what happens next, as these fish-eating orcas continue to hunt for chinook salmon and then switch this fall to chum salmon when the chinook grow scarce. The Center for Whale Research’s efforts to keep track of the Southern Residents is funded in part by the federal government, but the center’s other work involving orcas depends on donations and memberships. Go to “Take Action for Orcas” for information. Let’s hope they find and eat the 3mil pounds of pen raised salmon that escaped inadvertently several weeks ago!